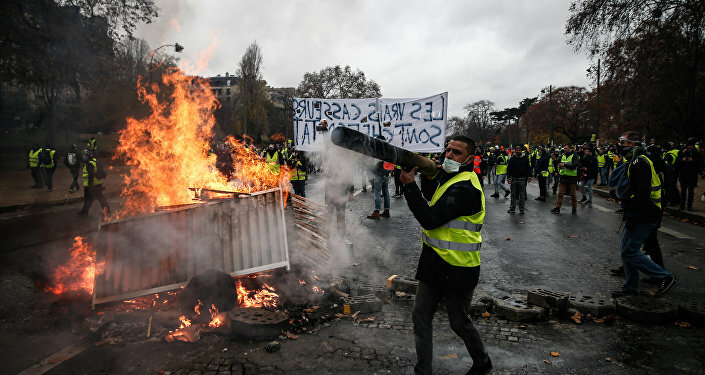 On Tuesday, the French government blinked: under intense pressure from the Gilets Jaunes protests - the “Yellow Vests” demonstrating in the streets of French cities for weeks - Prime Minister Edouard Philippe declared a six-month moratorium on the fuel tax increase and froze electricity and gas price hikes for three months. "Three fiscal measures were to enter force on 1 January next year… Having heard this demand expressed by almost all of the interlocutors I have met throughout consultations in recent days, I am suspending for six months these fiscal measures," Philippe said before the National Assembly in Paris on Tuesday, Sputnik reported. 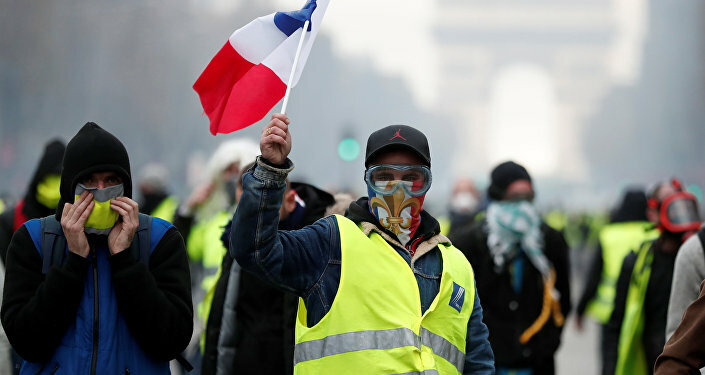 The Yellow Vest demonstrations began November 17, motivated by sharp increases in fuel prices as well as new taxes due to begin at the end of the year, which many working people said would put them further "in the red." Since then, the demonstrations have erupted in cities across France, ranging from peaceful protests to civil disobedience to the lighting of fires, destruction of boutiques and of luxury cars, and clashes with the thousands of riot police summoned to the metropolitan areas to quell the demonstrations. The movement has a distinctly decentralized character, being organized and coordinated via social media, which has been both a strength and a hindrance. On the one hand, there are no leaders, only issues; on the other — there are no leaders. The range of politics finding articulation in the demonstrations spans from the right-wing Front National and Debout la France to the left-wing La France Insoumise. Both Marine le Pen and Jean-Luc Melenchon have proposed dissolution of the National Assembly and the holding of new elections in response to the crisis. "I'm not right or left, I'm a Gilet Jaune," schoolteacher Marie Lemoine told the Guardian. Likewise, spokespersons claiming to represent the Yellow Vests have sprung up in cities across the country, declaring themselves to be apolitical but later being revealed to have hard-right connections. For example, Frank Buhler, who has emerged as a major leader of the movement on social media, was ejected from Front National last year for racist remarks, France 3 Occitaine reported on November 23. The news outlet reported that it was his idea to extend the demonstrations to the French capital itself, and that he took a major role in beginning them there. Other episodes have shown the opportunistic nature of some of the demonstrators: Europe 1 reported on Yellow Vests in the Somme who turned six migrants hiding inside a fuel tanker truck over to the gendermeries Tuesday. "What a shame," tweeted Thomas Portes, a spokesperson for the Communist Party of France. "Decidedly for them, the solidarity stops at the skin color and origin." Quelle honte! Hier des #giletsjaunes ont remis aux gendarmes des #migrants qui se cachaient dans la cuve d'un camion-citerne. Décidément pour eux, la solidarité s’arrête à la couleur de peau ou à l’origine. Et après on s’interroge sur notre absence à leur côté? C’est à gerber! ​Radio Sputnik's Loud and Clear spoke with Gilbert Mercier, a French journalist, editor in chief of News Junkie Post and the author of "The Orwellian Empire," about the developments and their effects on the demonstrations. ​"Too little, too late" seems to be the feeling, Mercier said, not only among the Gilets Jaunes but among many members of the National Assembly as well. "It's not going to defuse anything," he said, noting the National Assembly's reaction was "less than lukewarm." However, he noted that "it's not a coincidence" that the price hikes were being put off until after the European Parliament elections in late May 2019. "This anger, you'd have to be deaf or blind not to see it or hear it," Philippe said in his address Tuesday. "I've measured its force, its gravity. 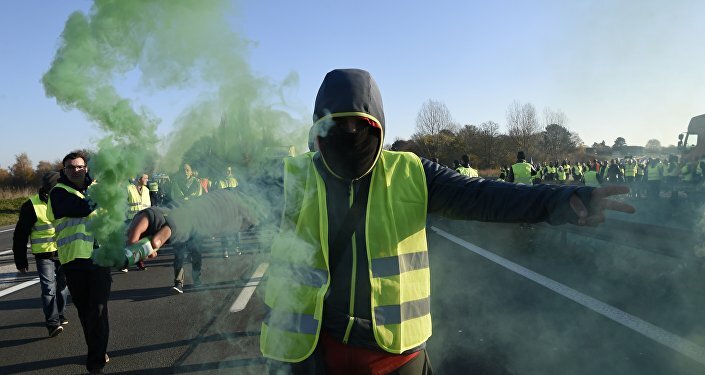 This anger finds its origin in a deep injustice… The French who have donned these yellow vests want taxes to fall and work to pay. That's also what we want. If I didn't manage to explain this well, if the ruling majority didn't manage to convince the French, then something must change." Mercier said Philippe's language was "tone deaf" and he was "saying something people want to hear," but noted that the government had not offered "the concrete measures that the Gilets Jaunes are expecting — which are numerous — I mean, for example… raising the minimum wage to 1,300 euros a month," along with other measures such as reimposing the Impots sur les Fortunes, or tax on fortunes, which was scrapped by the Macron government last year in favor of a system that leaves financial assets untouched. "Since the crash of 2008, there have been austerity measures in France, and if the economy has sort of revived, the salaries of people have not increased. So with an inflation [rate] of between 2 and 3 percent per year, in 10 years, well they've lost buying power, they've lost about 25 to 30 percent," Mercier said. Mercier said the Gilets Jaunes know the Macron government is lying about the causes for the much higher prices of gas in France than in, for example, the United States. "Out of that money, of course the price of crude is pretty much the same everywhere; 64 percent is in tax," he noted, "but it's supposed to finance what they call the ‘transition ecologique'… but only 20 percent of that revenue finances that, so people understand that they are really, truly getting screwed, they're getting taken for a ride." "The French are teaching us a lesson," said American host Brian Becker. "If you want to win, you have to go into the streets." "It's the lesson that revolutions are quickly forgotten, and they always need revolution; they need to be freshened up at some point," Mercier told Becker and his co-host, John Kiriakou. "People are saying, ‘Oh the violence, the casseurs ["breakers" in French], the vandals, they're terrible, they're breaking those beautiful things, symbols of the republic' — yes, but that very precise republic was built on the guillotine and the blood of aristocrats and destroying their side," Mercier said. "And that happened very quickly." "What we don't have right now, we don't have the [Georges] Danton, the [Louis Antoine de] Saint-Just, the [Comte de] Mirabeau, the [Maximilien] Robespierre of the time," he said, naming figures from the French Revolution, "but it should be teaching everybody a lesson, especially in the US, because General Motors just announced they would cut 60,000 jobs very, very soon… Sears is closing down. It's completely bankrupt; the CEO is taking all the money while everybody is going to be out of a job — 68,000 people." "People have to understand… this is the failure of neoliberalists," Mercier said, noting that Emanuel Macron is the French equivalent of the so-called "Chicago Boys," a group of economists who trained at the University of Chicago's Economics Department in the 1970s and 1980s under famed economist Milton Friedman, a vocal advocate of free markets and small governments. "Let's not forget that Macron, before working in government, was a commercial banker at Rothschild [& Cie Banque]." "So he does understand certain interests: the interests of finance, the interests of Wall Street. It is failing; it is failing all of us… everywhere."